All Metro lines are slowed by single-tracking this weekend, but the most significant disruption is on the Orange, Silver and Blue lines. Here's what you need to know. 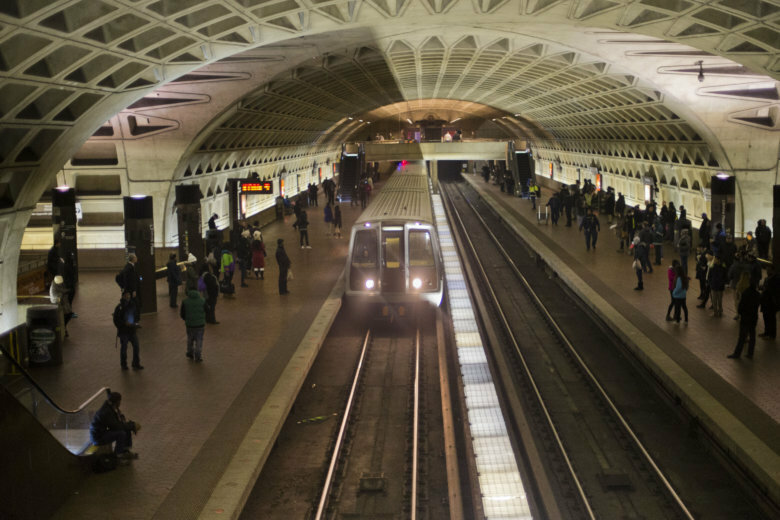 WASHINGTON — All Metro lines are slowed by single-tracking this weekend, but the most significant disruption is on the Orange, Silver and Blue lines. Orange and Silver Line trains are scheduled every 24 minutes each with single-tracking between Eastern Market and Stadium-Armory. Blue Line trains are also scheduled every 24 minutes each Saturday and Sunday, but will only run between Franconia-Springfield and Eastern Market. Yellow Line trains are cut back to only run between Huntington and Mt. Vernon Square. Yellow and Green Line trains are scheduled every 16 minutes with single-tracking between U Street and Georgia Avenue. Red Line trains are scheduled every 16 minutes with single-tracking between Friendship Heights and Medical Center, with some additional trains during the day at stations between Farragut North and Silver Spring. A number of events around the region also slow down drivers this weekend. Sports-related traffic delays could include fans going to or from the Capitals game against the Maple Leafs Saturday night, and any crowds that go to Landover to see the Redskins host the Panthers at 1 p.m. Sunday afternoon. It is also the second-to-last weekend of the Maryland Renaissance Festival, so there could be extra traffic in Crownsville. All weekend, Pennsylvania Ave. NW and Constitution Ave. NW between 3rd St. and 7th St. in D.C. are closed for the Snallygaster Beer Festival. Saturday morning, the National Law Enforcement Run for the Badge also closes Independence Ave. SW between 3rd St. and 7th St. and roads near Judiciary Square. All day Saturday, the rescheduled H Street Festival closes H St. NE between 3rd St. and 14th St. as well as all roads that cross H Street in that corridor. As part of continued early morning weekend closures in Virginia through the first weekend in November, the 95 Express Lanes will be closed between Route 234 and Dale Boulevard and Interstate 95 could be temporarily stopped in early morning hours for power line work. All weekend, the Interstate 395 HOV lanes are scheduled to be closed from Edsall Road to the 14th Street Bridge for continued work on the conversion of the lanes to toll lanes. In Rosslyn, a detour is planned Saturday and Sunday for the Virginia Wine Festival which will close eastbound Lee Highway (U.S. 29) at Fort Myer Drive. In Bethesda, the Bethesda Row Arts Festival closes parts of Woodmont and Bethesda Avenues Saturday and Sunday. On Monday, about two years of construction begins on Arlington Memorial Bridge. Half of the bridge, including the sidewalk on that side will be closed into 2021. During the work, the bridge will be reduced to three lanes, with one of the lanes serving as a reversible lane. The National Park Service has hung lane control signs that will show a red ‘x’ or green arrow to indicate which lanes are open. To start, the lanes and sidewalk on what is normally the outbound side of the bridge will be open. The latest traffic is always available from the WTOP Traffic Center.